Here are collected those illustrations of a more symbolic nature, not directly connected to some quote in the novels, but trying to express by means of design the underlying themes and concepts of the books. Melisandre and Night’s Queen, representing the Ice and Fire duality. 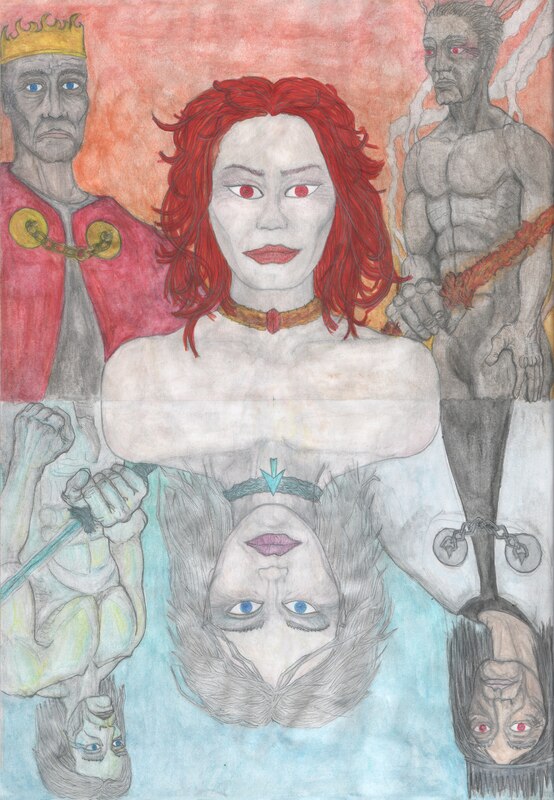 In this drawing Melisandre, together with King Stannis Baratheon and a Shadow Warrior stand juxtaposed to Night’s Queen with Night’s King and a White Walker. The female embodiments of Fire and Ice well represent the themes of the books: the kings give their seeds to these powerful women to create soldiers that will fight in the War for the Dawn on opposite fronts. But is this conflict absolute? Are Fire and Ice powers opposite to each other, engaged in a never ending struggle, or is there some connection in these elemental forces? If on the Fire side we have fire colors, Melisandre’s reds, the orange, yellow, red and gold of the flames. On the Ice side we have cold colors: the blue of the Others eyes, the white, grey and silver. But Ghost’s eyes are red, and so the Weirwood’s eyes. That’s why I figured that, even if on the Ice side, Night’s King’s eyes might be red, just ad Stannis’s eyes are blue! 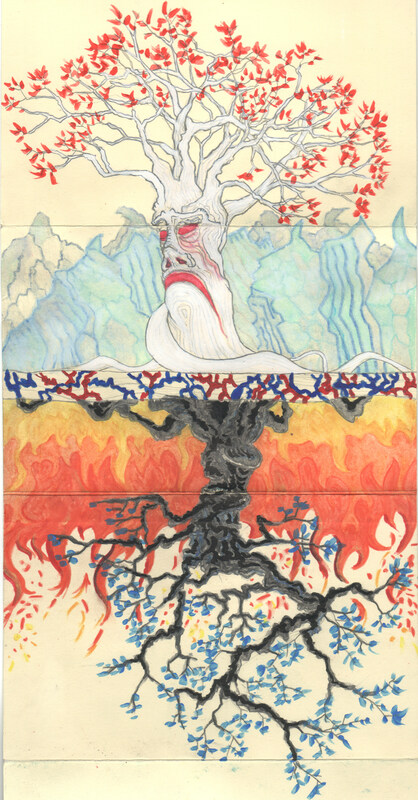 The Ice and Fire duality is well represented in the juxtaposition of the Weirwood and the Shade of the Evening tree. White, red for the Weirwood; black and blue for the Shade of the Evening tree. Both types of trees have something to do with religion or magic, both trees sap is used for the preparation of a psychotropic drug, capable of opening the minds of the users, enabling them acces to supernatural forces and knowledge. I represented the trees before Ice and Fire backgrounds. I imagined the Great Hall of the Iron Throne, in the Red Keep. But, as seen in a dream, where the walls are there, but also the symbols might exist in the same space. We know that the crow, or raven, is being used as a metaphor for different characters in the books. We have Bloodraven (Lord Brynden Rivers), Bran Stark and King Euron Greyjoy. On the other hand we have the Dragon. And for the purpose of this drawing I thought it might represent at least two characters: them being Queen Daenerys Targaryen and King Aegon Targaryen the Sixth (though many theorize Aegon might be a Balckfyre, more likely than the real son of Prince Rhaegar Targaryen). 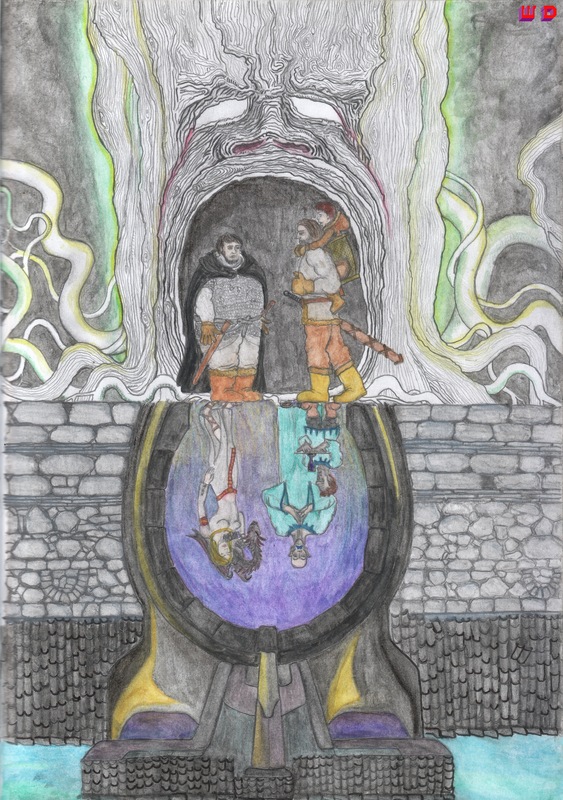 In this drawing I represent Crow and Dragon both descending on the Iron Throne. At this point in the books (the end of A Dance with Dragons) is more than likely that many of these characters would be really descending on the Iron Throne; trying to conquer the Seven Kingdoms, having some claim on the Iron Throne. Or, in the case of Bran and Bloodraven, at the least having a role of great significance in the great war that’s about to take place in Westeros! Looking for knowledge, going after knowledge; passing trough these portals Bran and Dany are entering a wider world! The “Drink from the cup of Ice, drink from the cup of Fire” quote is paramount! It summarizes the drive to knowledge Bran and Dany share, a knowledge deep in the elemental forces of this world; they both are on their way to it through these portals apparently opposite to each other.